Even if the weather is bad, that is no reason to forgo your favorite fantasy, gothic, and medieval styles! 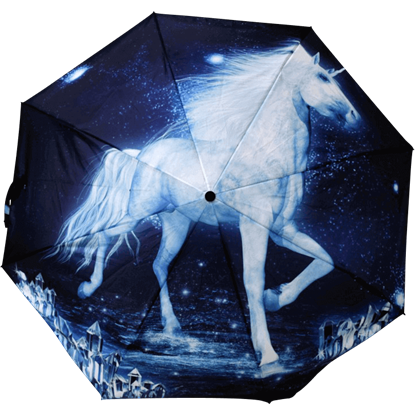 Many of our umbrellas feature the work of famous fantasy artists on their canopies, so you will find dragon, unicorn, and fairy art umbrellas here. 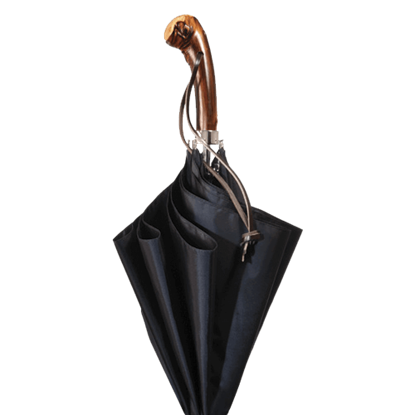 We offer telescopic fantasy and gothic umbrellas that will fit inside bags and purses when not in use, as well as carved handled umbrellas and even a sword hilted umbrella! Also shop here for steampunk and gothic umbrellas and lace parasols that will add an extra touch of finery to your look. 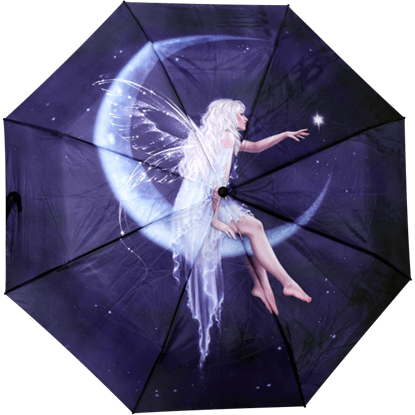 Whether you are looking to keep sun or rain away from your person, be sure to check out our selection of fantasy umbrellas here. And keep checking back, as we will add more products to this category as they become available. Just when it feels like a good day, disaster strikes and the rain comes pouring down. Do not let the deluge get you down. Get the better of it by picking up an Appalachian Handled Umbrella to keep you dry and add cheer to your day! At home in the night sky, this gorgeous fairy sits on the crescent moon and reaches out as though to touch the brightest star in the sky. 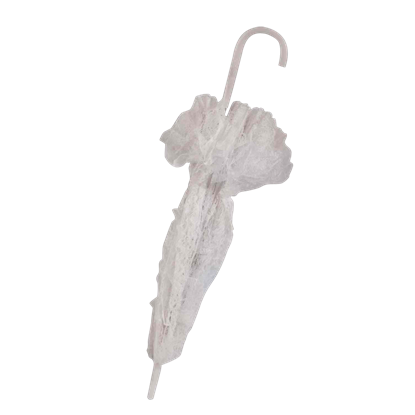 Represent your love for fairies even on rainy days with the Birth of a Star Fairy Umbrella. 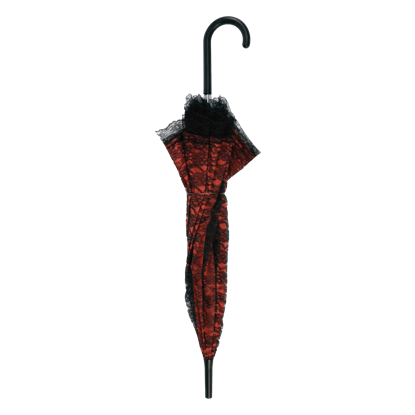 The Black and Red Lace Parasol is an interesting amalgam that combines a parasol from history with a dark and decadent gothic style, leading to the creation of a delicate accessory that is perfect for accenting a true gothic style. In the eras of antiquity, women carried parasols around to shield themselves from the sun, both to keep cool and to avoid damaging their delicate appearance. This Black Lace Parasol is similar to what they would have carried. Just when it feels like a good day, disaster strikes and the rain comes pouring down. Do not let the deluge get you down. 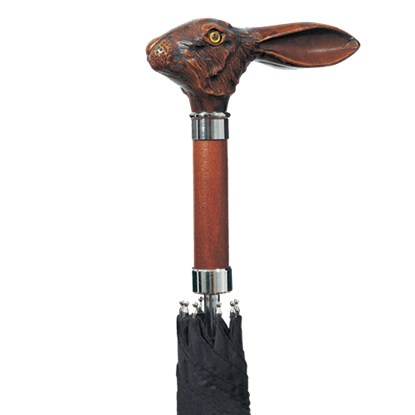 Get the better of it by picking up a Jack Rabbit Handled Umbrella to keep you dry and add cheer to your day! Just when it feels like a good day, disaster strikes and the rain comes pouring down. Do not let the deluge get you down. 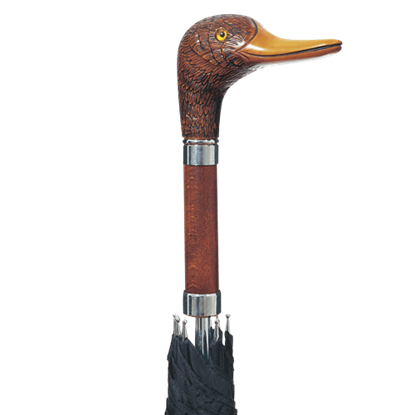 Get the better of it by picking up a Mallard Handled Umbrella to keep you dry and add cheer to your day! Raindrops will think twice before coming after you when you fend them off with the Skull Umbrella. 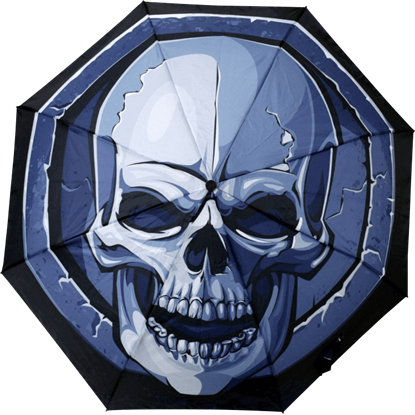 This gothic umbrella has an allover graphic featuring a big, grinning skull face over concentric bands of black, gray, and blue. Some umbrellas are more for style than protection from the rain. They keep the sun off you, and they look incredible doing it! 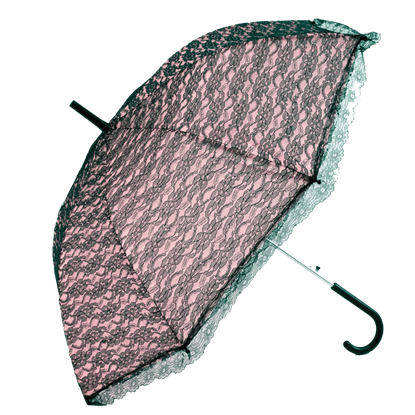 Take the Steampunk Lace Parasol, for example. With its Victorian aesthetic, you will look great! A beautiful white unicorn trots through the shallow waters of a cave, while nearby crystals fill the area with a faint blue glow, giving everything an ethereal look. This is what you will see when you open our Unicorn Umbrella. 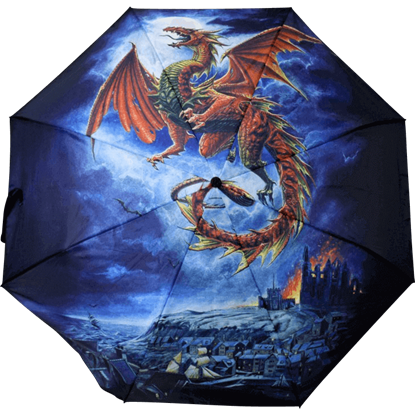 The image that you will see on the top of our Whitby Wyrm Dragon Umbrella is that of Alchemy Gothic's Whitby Wyrm. It depicts a spiked, red European dragon flying over the rooftops of a town while a castle burns in the distance. In the eras of antiquity, women carried parasols around to shield themselves from the sun, both to keep cool and to avoid damaging their delicate appearance. This White Lace Parasol is similar to what they would have carried.